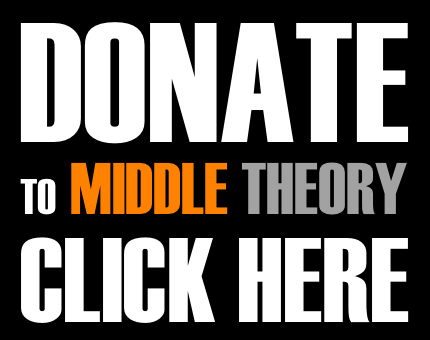 Click the button below to send a donation amount of your choice to Middle Theory. At Middle Theory, we believe that you should get what you pay for… but here’s the catch: we don’t charge you anything for the content we provide. The free exchange of ideas is of great importance in the world today, and therefore we pledge to provide as much to you as possible, without attaching any dollar signs to what we labor to produce. Just as we believe in giving to our listeners, we also believe that our listenership can, and will recognize the kind of talent and devotion that goes into making Middle Theory happen on a weekly basis. Therefore, we rely on your pledge for support to keep this ship afloat, and ask that if you are able, to please consider donating an amount of your choice to Middle Theory. Think of it as an ongoing crowd funding campaign… and the more our listeners put in, the more we are able to give back. 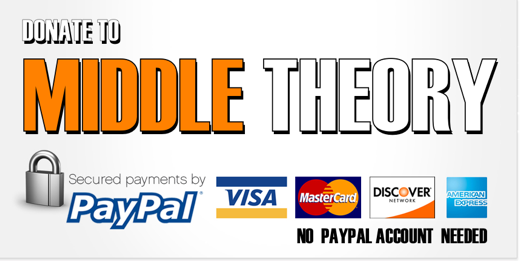 There are a number of ways you can donate to Middle Theory: Paypal, WePay, or by sending a check or money order. We’ve included information about each of these for you below. The first (and most familiar) method of donating is by using PayPal, which you can do by clicking the button at the top of this page. From there, you’ll be directed to our PayPal donations page. PayPal accepts all major credit cards (you don’t need a PayPal account to make your donation), and please note that once you are redirected to the PayPal donations page, you also have the option of checking a box that will allow you to elect to make your contribution a recurring donation. That way, if you’d like to pledge $50 a month, for instance, this amount will automatically be drafted from your account without you having to do anything else (recurring payments can be cancelled at any time, of course, through your PayPal account information). Thank you for helping support the Middle Theory Podcast!